Today wsa probaby my toughest day so far, alot tougher than yesterday and the 110km day was nothing compared to today! I don't know what happened to me today but I just didn't want to do the damn hills! 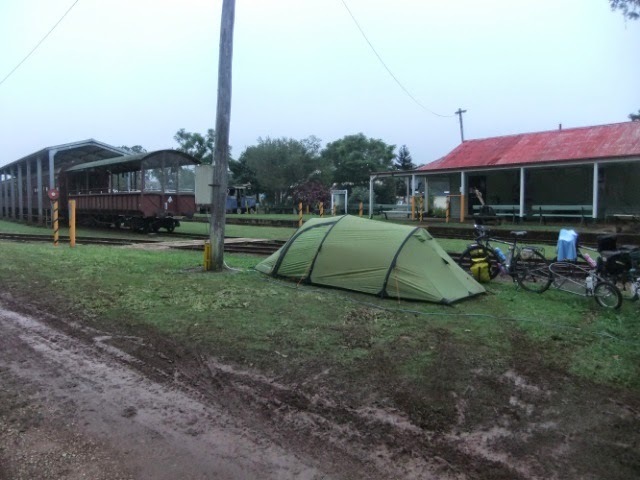 We got up this morning and there was just a light shower passing. 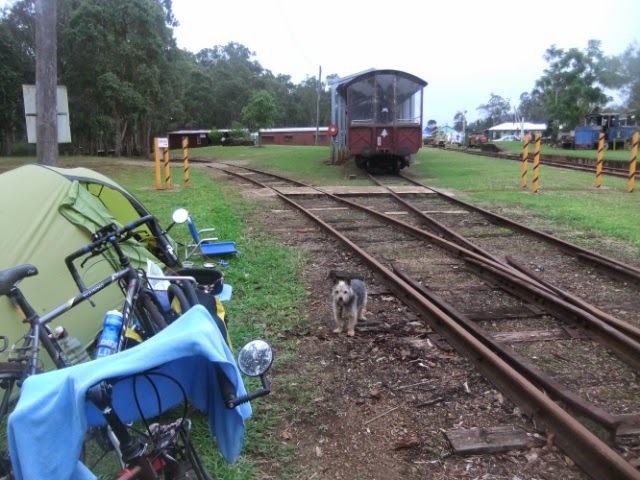 We listened to the ABC news and heard there had been a truck and car collision on the Kuranda hill so that was closed to traffic in both direction (lucky it didn't happen yesterday!) 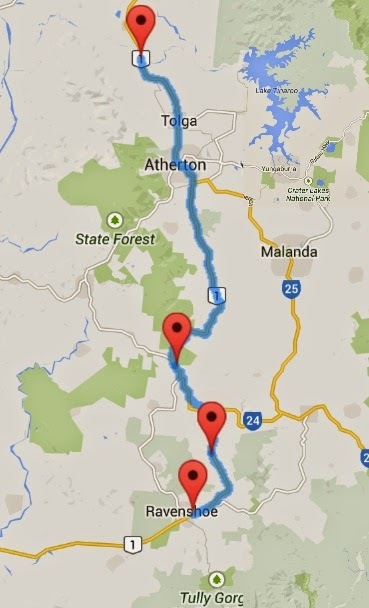 and there was also a multi car pile up on the Atherton Malanda road so that was closed. The wind was blowing really hard last night and continued on this morning and since we are out in the open still until Atherton I really felt it. At Atherton we picked up supplies like milk powder, rice meals, dog biscuits ... all things that are expensive when you buy it in a small town food place. As this is the last Woolies until Cloncurry in another couple of weeks! We left Atherton at around 10am and all you do is start to climb, climb, climb and for something different ... climb! Crikey the going was tough and slow. Poor Neil was already looking for a campsite on the side of the road thinking that I am not going to make it. To make things worse from Atherton to about the 30km mark we were in open country (just like the North island of NZ) so the headwind was really felt. We had a cuppa just before heading into the ranges and up in the clouds ... no joke! 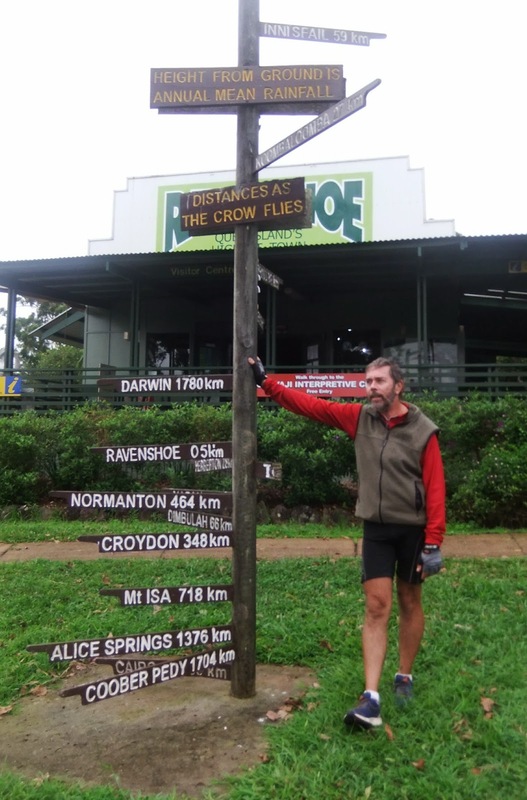 There was no photos taken until we got to Ravenshoe as we spent from 35km to 60km in the clouds! Not long after the cuppa you begin to see fog warning signs and then you can barely see 20m in front of you. We could not see the view or even the hill we were climbing we could only "feel" the hill! Some parts of the hills were steep but most were just gradual but still slow going, after all the climbing yesterday the legs just didn't want to work. As we rode on in the fog/low lying cloud - it was a dry cloud as nothing was getting wet but it was thick and very difficult to see cars, we could hear them but had trouble seeing them which means that they would have difficulty seeing us. So it was very tense when you went around a corner (and it was very very winding) and then when the cars came up behind you but all were very good to us and slowed right down when they saw us and over took us ... maybe they felt sorry for us! So we had this all day always above the cloud at around the 1100m mark which is very high. 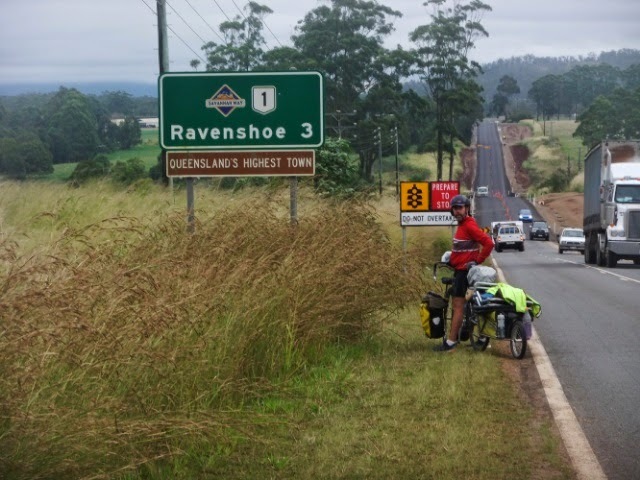 It took us 5.5 hours to do this ride and we didn't get to Ravenshoe until 4pm so we were on the road for nearly 8 hours! I have used Neil as a reference ... that is how much rain they get on average each year so maybe around 3.5m per year! 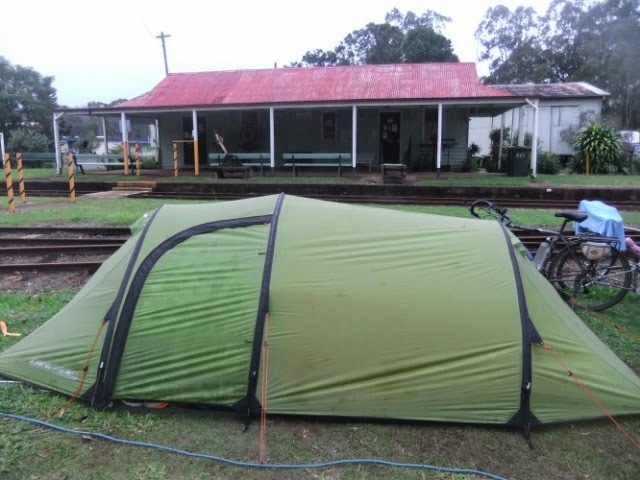 The caravan park is in the railway museum area and was free but has progressed into a town caravan park ... cheap to camp - we have the best location! LOL that train will go to Tumoulin this Sunday at 1.30pm. They had rain here yesterday and the day before but not much but the park seems very boggy and churned up but then again a local definition of not much rain could be quite different to what we would determine at not much rain! To me the first photo shows the road and the amount of churning up so that to me means they had alot of rain! We are staying here tomorrow and since there is no laundry we will have to wash and dry our clothes at the laundromat. We haven't had clean dry clothes since Townsville.